A breathing solution for treating chronic respiratory allergies. It's composed of three key herbs like Haridra, Tulasi and Vasaka that work in conjunction to provide relief from respiratory allergies. The anti-inflammatory properties of Haridra help in effectively combating allergies, Tulasi helps promote optimum respiratory comfort by reducing the symptoms of allergy, while Vasaka normalizes the lung function. 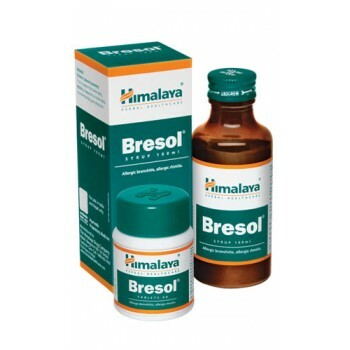 Extensive research of over 10 years has gone into the development of Bresol. There is adequate research data indicating that it helps to reduce symptoms of allergic rhinitis such as nasal congestion, post-nasal drip, and itching of eyes and nose. The drug is also useful as an adjuvant therapy in asthma as it reduces the asthma score and eosinophil count, thereby improving lung function tests. 2 Tablets 2 times a day or consult your physician to prescribe the dosage that best suits the condition. Available as a tablet or syrup. 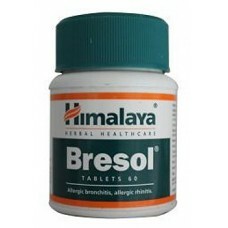 Bresol is not known to have any side effects if taken as per the prescribed dosage. Natural products treat not the symptoms but the body as a whole; absorption and results may take time. Maharishi Ayurveda - Asthomap 100 Tablets A well-thought-out combination of herbs which counter..
Charak - Haleezy 20 Tablets A proprietary ayurvedic medicine by Charak. It is natural bronchodi..
Divya Patanjali - Haridrakhand Powder 100 g The main ingredient of Haridra Khand is Turmeric wh..
Himalaya Herbals - Haridra 60 Tablets Turmeric has many medicinal properties and is commonly us..
Himalaya Herbals - Bresol Syrup 100 ml A breathing solution for treating chronic respiratory al..
Nagarjuna - Allergin Granules 100 g A proprietary ayurvedic medicine by Nagarjuna for the treat..